I will never forget the person who said that to me, because they were quite serious. It was over a cup of coffee, and they were explaining to me why they were so unhappy to be living in Fort McMurray. They felt they had nothing to do here, nothing to offer and nothing to give, and that there was nothing they could do that would change it, and so they were looking at leaving. If there has ever been a place where the actions of one person – even small, simple actions – could make a difference it is this place. This is a place where people have come from all over the world, bringing with them their skills and talents and their challenges, too. Some arrive with family and friends while others arrive alone, and together we are building and shaping this community. Every single person has the opportunity to contribute to it in a way that is almost unique, as this community continues to change every single day and with every new addition. I suppose that is why when I was approached to join a committee for a new initiative I said yes – and my involvement with 3 Things for Wood Buffalo began. 3 Things for Wood Buffalo is based on the very successful 3 Things for Calgary, an initiative to encourage residents to do three things – just three things – to contribute to their community. They can be three very simple things, like picking up a piece of trash or holding a door open, or big things like planning a new fundraising event for a good cause. The concept is to do those three things and then to share them on social media, creating a cascade effect where three things becomes another three things, and so on, and so on. The beauty of the entire three things movement is that each and every person can contribute. Each and every action can lead to another – simply holding a door open for someone else can encourage them to do something kind for someone else. Kindness is contagious, and this is perhaps the most fundamental point the individual who began this post didn’t understand. Just by doing one kind thing – or even better yet, three – you can change a community in ways you may not even comprehend. I am delighted to have been there for the founding stages of 3 Things for Wood Buffalo. One of the three things I do for this community is telling stories in this blog that reflect the generous and kind nature of the people in this place. Having the opportunity to tell these stories is truly a gift in my life, and just as I am honoured to share them I am even more honoured to hear them and on occasion be part of them, because it has changed me, too. Today I encourage everyone to become part of the 3 Things movement. Do three things, large or small, for your community, and then share them. Tell others what you have done and allow your actions to encourage others to do their own three things, and suddenly three things are six things, and then nine things, and so on, and so on. It becomes a landslide of kindness and good acts, not random ones but ones that are done thoughtfully and with intention to make this a better place to live, work and play. So get out there and do 3 things today, Wood Buffalo. The challenge is on. Email me at mcmurraymusings@shaw.ca and tell me your three things and I will share them in this blog, or if you are on Twitter tweet them at me @mcmurraymusings and I will retweet them. Let’s get this landslide going – and along the way change our community, and ourselves, for the better. When my elderly parents entered the medical system in the final years and months of their lives I learned something I had not known before. I learned how family members of those in care must become advocates for their loved ones, as once they have lost the ability to advocate for themselves they are reliant on others to advocate for them, to be their voices and ensure their needs are met. After my father’s lingering death in palliative care from lung cancer and my mother’s rapid demise in an ICU after a cerebral aneurysm I became aware not only of the fragility of the human condition but of how a massive system like medical care can forget that what is being dealt with are people, not just patients, and individuals, not just beds. The front line staff were, almost without exception, very good at remembering this and provided exceptional personal care, but it was in my brushes with hospital administration that I sensed this was on occasion forgotten, particularly as related to the language used to describe the patients – the people – in their care. I recognize that every industry has its language – its jargon and lingo, and when one is dealing with automotive parts that is quite reasonable. When one is dealing with people, though, language that serves to see them as less than people – as objects – is dehumanizing and distancing, framing every discussion in a way that makes it sound as if you are dealing with parts, not people. One of those terms, and one that bothers me immensely, is “bed blocker”. In hospital terms this is a person who has been treated and is ready to be released into care – perhaps a continuing care facility or rehabilitation – but due to a lack of those spaces remains in their hospital bed, taking up a spot that may be urgently needed for another incoming person requiring care. It is sadly not uncommon and truly creates difficult situations in our hospitals as they try to deal with people who should be released into other levels of care so they can admit new people, but who are unable to do so as space does not exist in other levels of care. I am empathetic to the problem and I agree it needs to be resolved – but as both a person who has been there with elderly parents and a communications professional I soundly reject the term “bed blocker” as a dehumanizing, distancing and demeaning term used to describe what are, fundamentally, people in need. This would be why I was incensed to learn our new Minister of Health, Stephen Mandel, used the term in a recent interview when discussing the issue. I have not given a great deal of thought to Mandel’s new role, as I had always thought he served Edmonton well as their former mayor, and while I had some degree of misgivings about appointing an unelected member of the public to provincial cabinet I was quite willing to see how he performed – but when he chose to use a term that dehumanizes the very Albertans he wishes to represent I saw a bit red and went into a bit of a rage, because this is a bad start on the path to new leadership in Alberta health care. As a person and someone who had two elderly parents in care I can tell you how I would have responded had anyone referred to my parents as “bed blockers”. The people in our hospitals in Alberta, particularly the elderly waiting to go into care facilities, helped to build this province. They are our history and we owe them a debt of gratitude, honour and respect. Not only do we owe them excellent care in their waning years, we owe them language that treats them with respect and as people, not objects. They are not “bed blockers” – they are the very grassroots of our province, and it is reprehensible to refer to them in terms that demean them in any regard. Now, as a communications professional I can guarantee I would never advise a politician to refer to people who likely voted to support their party at one time in a way that dehumanizes them. I would suggest that no matter the terms used in “the industry” the tone set by a politician should always reflect dignity and respect when you are speaking of your constituents, the Albertans who built this province. I would advise that you have a responsibility to show empathy, understanding and honour to everyone, but especially to the most vulnerable because you will be judged on how you treat – and speak about – those groups the most. I would ban dehumanizing terms from the dialogue, and reframe it. When Mandel said that the new Premier had given him the “instructions to deal with the bed blockers” he could have easily reframed it. I would have suggested something like: “the Premier has given me instructions on ways to manage the many Albertans in need of care who remain in hospital after they are able to be released and finding ways to ensure they receive the care they deserve while also allowing the admission of new Albertans requiring care”. Much longer to say than “bed blockers”, to be certain, but reflective of the respect these citizens have earned. Perhaps there are those who think the issue of the terms used is a trifling one, but I disagree. How we frame a discussion – the terms we use – are our starting point and often reflect how we really think about the issue. I am gravely concerned to see a new Minister of Health using a term that objectifies the very people he now has the mandate to represent, and would suggest that he consider his words carefully as what he does – and what he says – will now be carefully watched and scrutinized, particularly when it comes to those in our province who are most vulnerable and most in need of respect. Albertans are not objects. They are not “bed blockers”, and they deserve more than to be called terms that distance and dehumanize them. Just as I was once my parents’ advocate it is the role of every Albertan to advocate for those who can no longer advocate for themselves, and today I advocate banning the use of the word “bed blocker” and other dehumanizing terms when discussing health care in Alberta. I believe this change needs to come from the top, and so it resides squarely with our new Minister of Health and how he chooses to frame the dialogue. It is a new day in Alberta politics, and a new start with a new Premier and cabinet. Perhaps it is also time for a new and more respectful dialogue on health care, starting with how we refer to the patients – the people – relying on us for their very lives. I have a tendency to not write too often or too boastfully about what happens at the place where I work. I suppose it is because I don’t want to seem to be trumpeting our horn too loudly or too frequently, but I do take immense pride in what we do at the Regional Recreation Corporation of Wood Buffalo – and Alberta Culture Days, taking place this weekend, is one of those events in which I find such pride. Ana Maria Mendez is the Manager of Arts and Culture at the RRC. It has been my genuine honour to work with Ana Maria since my first day on the job, and we have shared some remarkable moments as she works to bring amazing art exhibitions, workshops and opportunities to this region. Her commitment to art and culture in this region is incredible, and I have been increasingly inspired by her contributions to the local art and culture scene. 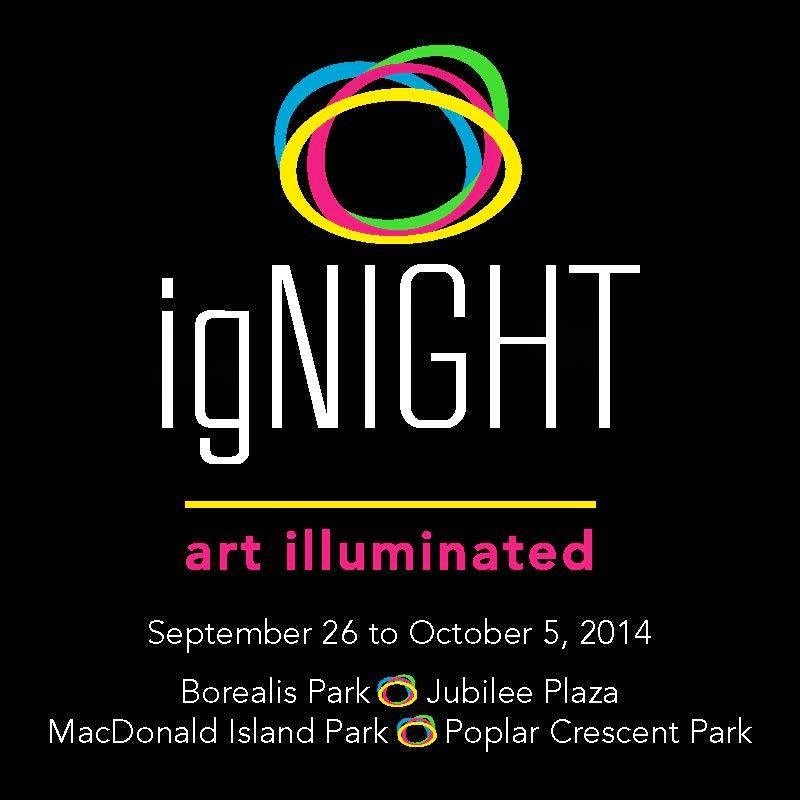 Being part of them in any small way has been a terrific learning experience for me, and this year when she and Lucie Bause, our Arts and Culture Supervisor (and someone I came to know as a fellow TEDx Fort McMurray 2013 presenter) shared their plans for Alberta Culture Days 2014 I was blown away. You see what is planned for Alberta Culture Days at the RRC is a full slate of activities designed to engage the entire family in art and culture in our region. From the exciting Wood Buffalo Mosaic Project, an ambitious undertaking to capture the images of 2,000 residents for the creation of two mosaics to be installed in Shell Place and the Anzac Recreation Centre, to the Miquwahkesis Project centred around the red fox that is such a fundamental part of our region to the Fort Mac Handcrafted Market, a Cabochon Culture Charms workshop with the Wood Buffalo Artists Forum to Flash Mob appearances from the MI Dance Academy, the halls of the RRC facilities will come alive with arts this weekend. The Wood Buffalo Mosaic Project brings amazing photojournalist Tim Van Horn to our community. Tim is on an odyssey called the Canadian Mosaic Project, an incredibly bold and audacious project to take the portraits of 54,000 Canadians from across the country to create a mosaic for 2017, when Canada will celebrate its 150th birthday. Travelling across the country, Tim is making a stop in our community to take some photographs, share his passion for telling the story of Canada and meet our residents. This project, as astonishing in scope as it is in passion, is truly a remarkable journey for Tim and our country, and we are so very fortunate to have the opportunity to host him in our region. This weekend (and again on October 2 and 3) Tim will be taking photographs from noon until 6 pm in the main concourse of the Suncor Community Leisure Centre, and I know I for one will be there to have the Intrepid Junior Blogger and I included as part of this remarkable experience. The Miquwahkesis Project is one about which I am so passionate, as it has been part of my professional life since I began my job and it has become near and dear to me. This project, which will see a public art installation of artist-painted fibreglass foxes on the TOTAL Interpretive Trail in 2015, is similar to those in other communities that feature cows and pigs – but the central theme, the red fox, is one that has become so synonymous with our community that I cannot help but think of red fox when I think of Wood Buffalo. When I began working with Ana Maria on this project I suddenly noticed red foxes became a running theme in my life, seeing them virtually everywhere. The community is invited to participate in this project this weekend on Sept 27 and 28 at the Suncor Community Leisure Centre. 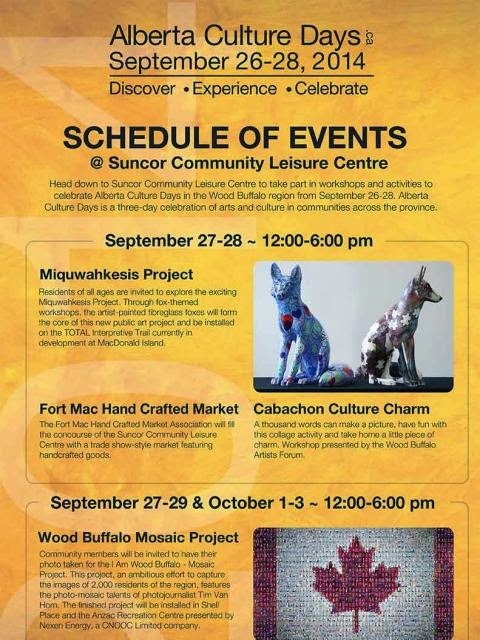 And this weekend the Fort Mac Handcrafted Market moves into the Suncor Community Leisure Centre, bringing vendors who create beautiful pieces of art and craft for sale. I am incredibly excited about this initiative as I love nothing more than local artisans, passion for your craft or art and a willingness to share it with others. 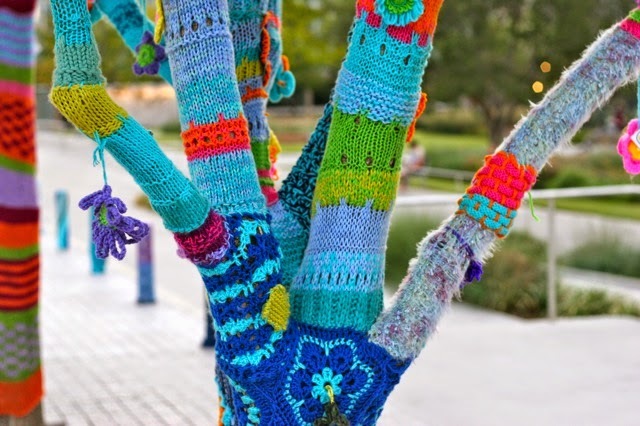 The Fort Mac Handcrafters even have a sneaky little project up their sleeves having something to do with “yarnbombing”, a type of non-damaging, beautifying public art that has been called “graffiti with string”. 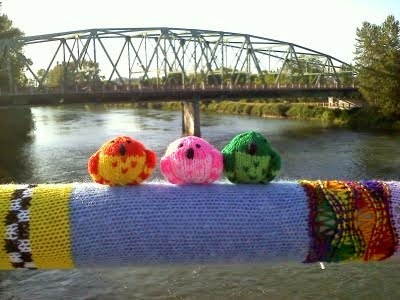 To my knowledge Fort McMurray has never before experienced yarn bombing, so I am excited to see the reaction to this grassroots public art. Add in the other featured events – flash mobs and a workshop from the Wood Buffalo Artists Forum, plus an installation as part of the RMWB “igNIGHT”, and you have a full weekend of activities taking place in just one location – and then add in all the other Alberta Culture Days events taking place across the community (the Northword literary magazine issue launch event on Saturday at Keyano, the various igNIGHT installations around the community, The World Meets in Wood Buffalo showcase on Saturday and Sunday) and you have an absolutely dizzying array of events and offerings focusing on arts and culture in our region...Wood Buffalo is alive with arts and culture, you see, and while it is there and present all year round this weekend we truly celebrate this aspect of our community and let it shine. 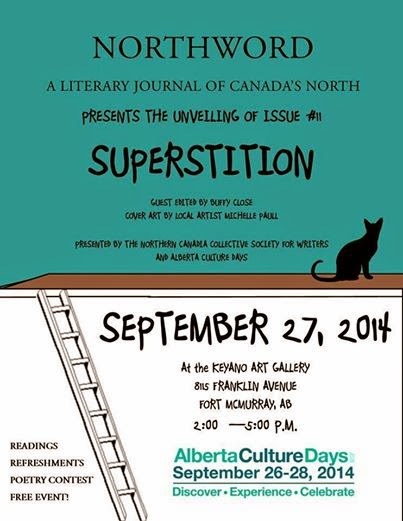 Despite my rather slow recovery from my recent medical adventure I intend to take in as much as possible this weekend of Alberta Culture Days, starting with our events at the Regional Recreation Corporation. I will get my photo taken, check out the red foxes, and visit the vendors at the market. 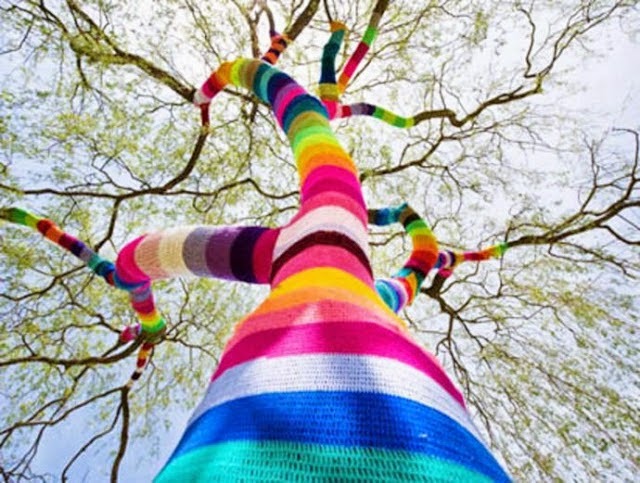 I will take photos of the yarnbombing and I will be one of those cheering on the flash mobs – because you see all these events feature local people, residents of our community who are celebrating art and culture this weekend. This weekend might be Alberta Culture Days – but in my mind it is Wood Buffalo Culture Days, and a weekend to celebrate all the things that are great about this region, our people and our community. I hope to see you – yes, you! – celebrating right along with the rest of Wood Buffalo. 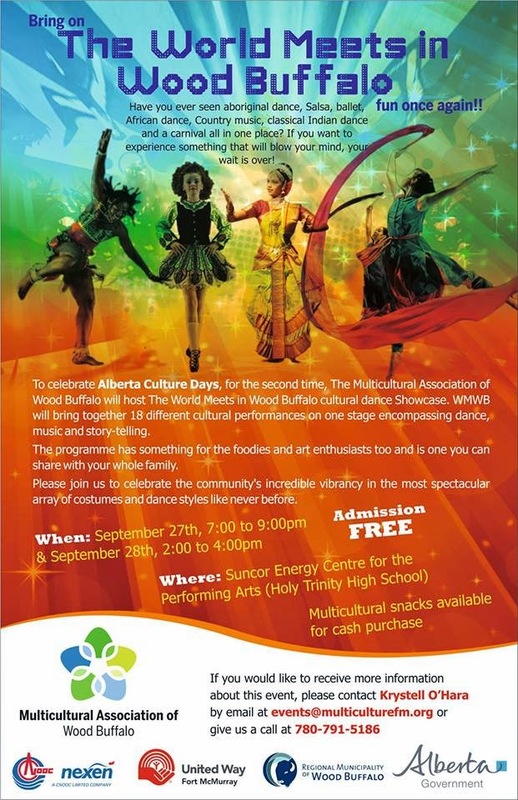 Click this for a comprehensive list of Alberta Culture Days activities! When my friend Tim Moen first mentioned an idea he was contemplating I was intrigued. It was around when Tim and I were spending some time with two funny guys from LA (literally funny guys, as in comedians) who had come to Fort McMurray to film a satirical documentary on the oil sands. Tim was helping them with filming, as he is a noted local filmmaker, and I agreed to help them connect with other local people as well as spend some time with them explaining the community aspect of Fort McMurray. I found the entire experience incredibly interesting, as the daring duo from LA were not only fun but engaging, bright and intelligent men with genuine questions and concerns about the oil sands industry and its impact on our world – but they too recognized the flip side of this coin, meaning the world reliance on oil production and its contribution to the development of the very industry so many decry. During that period Tim came to me and said he had an idea. It was all about turning the idea around. Both Tim and I had grown very accustomed to celebrities, filmmakers, journalists and photographers coming to our town to tell their narrative about oil sands development and it was rarely a positive experience for us or our community. One thing we had noted, though, is that few of these individuals arrived without a narrative already in mind, having already written the plot without even meeting the characters. We also noted few of them were keen to discuss the world’s reliance on oil and how that drives the development of the industry, and how their own actions contributed to it (as few arrived on bicycles, using cars and planes instead, and most lived in mammoth cities across the world heavily reliant on oil). Tim said maybe, just maybe, the time had come to turn the tables on the critics and show the hypocrisy – and so Tar Sands Messiah was born. Tar Sands Messiah is a film project featuring Tim Moen heading to Los Angeles, where in a satirical light he will explore their reliance on oil, their contribution to the environmental degradation of the world, their community issues and all the themes of which we have become so accustomed to reading about ourselves here in Fort McMurray. It’s all about encouraging a dialogue on world oil use instead of the diatribe against the oil sands, a diatribe that solves little and fails to address an issue that extends far, far beyond the borders of this region: the world’s need for oil. I’ve known Tim for some time, and over the last three years have come to believe he is one of the most intelligent people I have ever encountered. I don’t think I am a dummy but on occasion Tim will head off in an intellectual direction that leaves me a bit breathless and confused (although strangely the Intrepid Junior Blogger often gets it, proving that she leaves her mother a bit behind in the smarts department). Tim has been on an incredible trajectory in the last few years too, having run in the recent federal byelection as the Libertarian candidate (and even being elected to the role of leader of the national Libertarian Party of Canada). And while I don’t always agree with Tim politically I have been delighted to see him propelled to national attention through the clever use of memes and social media and his outright dedication to everything he does. It was quite simply a very easy decision to support Tim in this new project idea, as I believe not only in Tim but in the genuine and sincere honesty he brings to the table. Making a film is not an inexpensive proposition, particularly when it involves travel to another country. Tim has turned to crowdsourcing to fund his project, just as the two funny guys at the beginning of this post did to fund theirs (and when Travel Alberta had their satirical video removed from YouTube for mimicking the “Don’t Forget to Breathe” campaign too closely their funding came fast and furious as nothing drives action like censorship). Crowdsourcing is an amazing phenomenon, and the best part of it is that by contributing every person becomes part of the project in some sense, instilling a sense of pride and accomplishment when it finally hits the screen...and it will hit the screen, as Tim Moen finishes what he begins, and this project seems to be part of his destiny. When Tim asked if the Intrepid Junior Blogger and I would agree to be interviewed we said yes, of course. The IJB, who is perhaps even more cynical than I, often expresses concern about the environment and the oil sands industry, but she is very clear on her understanding of how solving the problem goes far beyond addressing the issues in the oil sands but addressing the issues in the world driving the consumption of oil. She too is quite keen on Tim’s project as this world – this future – belongs to her and her generation perhaps far more than it does to me. She is one of the ones who will deal with the repercussions of whatever decisions we make today. She has a very real stake in this issue and she knows it. We spend a lot of time in this region discussing how to respond to the things that are said about our industry and community. It ranges from “we should ignore everything everyone says about us and stop caring” to “we should fight back tooth and nail, kicking and screaming”. I don’t believe there is a right answer, just the answer that seems right to each of us and one we must come to individually as our response is as unique as we are. What I do think, though, is that each person who chooses to respond needs the support of others in this community. We show our strength in our support of each other, in our support of grassroots projects like Tar Sands Messiah and in our willingness to show the other residents of this region that we will do whatever we can to help them succeed. 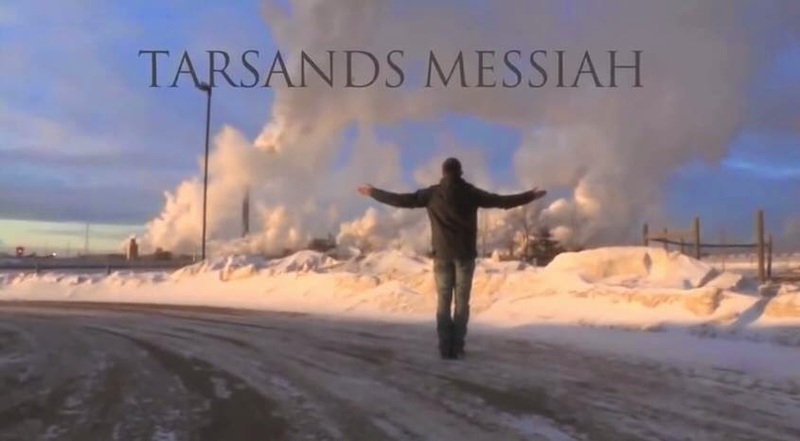 Today I encourage you to check out Tim’s trailer for Tar Sands Messiah, visit his Facebook page and consider contributing to hiscrowdsourcing to help him make this project happen. I have been following the Tar Sands Messiah for some time now, and this is one pilgrimage I think is worth getting behind. Let’s send Tim Moen to Hollywood – and change the dialogue through our own Tar Sands Messiah. Perhaps the most frustrating part of my recent battles with a rare eye disease has been the inability to sit for any length of time and write. The pain and nausea associated with my medical issue and recovery complications have made for many difficult and frustrating days, including forcing me to not write at a at a particular time when there is so much to write about in our community. I have missed several events and several occasions at which I would normally have been a presence. Instead I have been sitting at home on my sofa, watching a lot of Netflix and waiting to feel better. And finally, by some grace of whatever power exists in this world (including my corneal specialist), I do to some degree. As I pondered what to write about first I realized that one niggling detail of my life has been unshared. There has been a new addition to the family - or, as we have begun to call it, the Triple M Zoo - and he came from right here in Fort McMurray. Before we left on our vacation this summer I dropped by the Fort McMurray SPCA. The Intrepid Junior Blogger and I had been tossing around the idea of another cat for some time, but it would have to be the right cat. After all, how many cats can tolerate a house of one dog, one other cat, three ferrets, a hedgehog and two rather busy hoo-mans? I decided on a solo visit to the SPCA to scout out prospects, and on the branch of one cat tree I found a large lump of white and orange soft fur. The lump was purring loudly, despite there not being anyone around, and when I stretched out a hand a lovely large cat basically poured himself into it, looking deeply and lovingly into my eyes as the purring got louder. His name? Fitzsimmons. Now, I didn't want to get the IJB's hopes up, so I didn't tell her about my discovery right away. 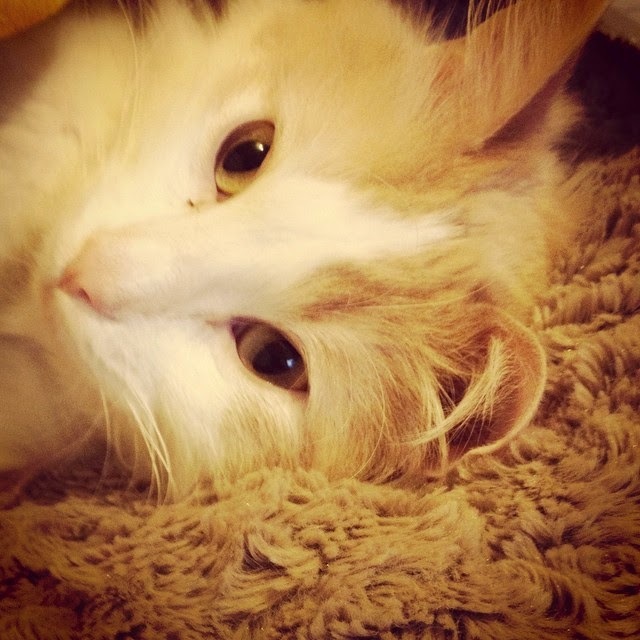 I knew we couldn't adopt him before our holiday as we needed to be home for some time after his arrival to help him acclimatize, and I figured this little gem of a cat would be long gone before our return. 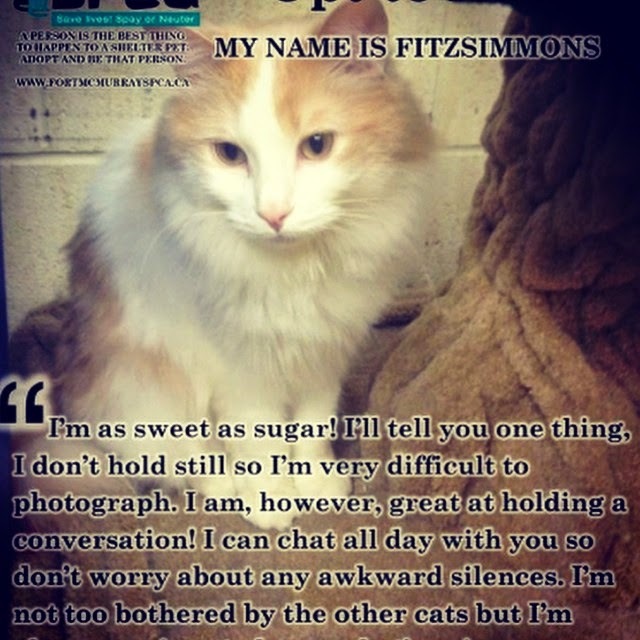 One night on the cruise, though, I spilled the beans, and just days after our return home we found ourselves back in the cat room gazing into some loving amber eyes with soft white and orange fur slowly coating us from head to toe (Fitzsimmons, as it turns out, is a prodigious shedder). What could we do? 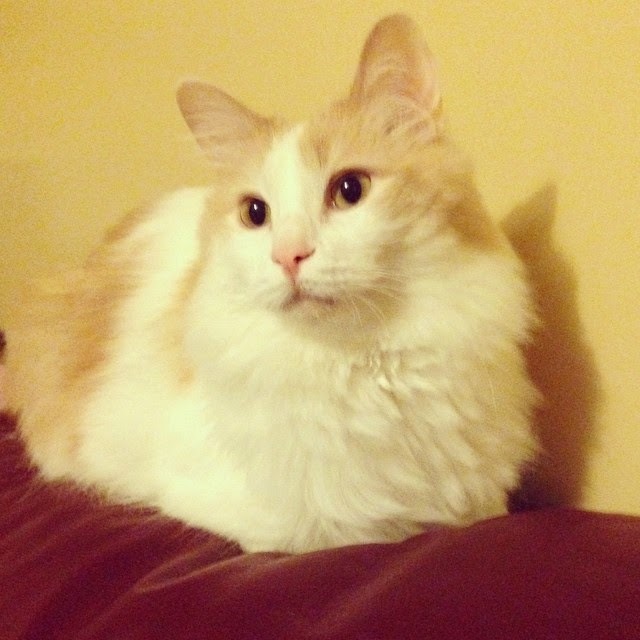 His info said he was good with other cats and even dogs, and most animals adjust to the ferrets (eventually). The hedgehog is rarely seen as he prefers nocturnal activity and seems to have never gotten over his basic disdain for all of us, so he isn't really a factor in the dynamics. So, after a very brief discussion we filled out the papers and a couple of days later we had a loudly meowing cat headed home in a carrier. Now, it has taken some time. At first Sirius Black, the resident cat, was completely appalled. We set the new arrival up in the laundry room to keep them separated and only allowed them supervised contact which usually ended in Sirius hissing and the new cat trying to hide. While Sirius is a ball of piss and vinegar, always ready for a rumble, the new cat was much like a large, soft, purring towel that wanted nothing more than to drape himself across you for hours at a time and smother you with affection (literally as he tends to wrap his massive white paws around your neck, all the better to stare deeply into your eyes with intense love and adoration). It took about 15 seconds for the IJB and the new cat to fall completely in love with each other. It took me only slightly longer, and after a few days even Sirius came around to the idea of having a "brother from another mother", someone he could pounce on and play fight (although the new cat is dubious of this pastime and spends most of his time trying to groom Sirius instead, smacking Sirius in the head when he protests and holding him down to lick his ears). They now happily share food bowls, a watering dish, and the litterbox, although the new cat has claimed the IJB as his own hoo-man while Sirius is quite intent on keeping me for himself, fixing the new cat with beady eyes when he gets too familiar with the loving. This works well for the IJB and I, as the new cat now sleeps with her and Sirius sleeps as always happily in his cat tree, keeping the house safe as he seems to be doubtful of the dog's ability to do so. And the dog? She is keenly curious about the new arrival as she and Sirius have quite a lively friendship and she likes cats, finding them interesting. She is very tender with the new arrival, simply watching him and wagging her tail when he appears, but at this point he seems content to keep his distance and leave that inter-species relationship for Sirius to handle. The ferrets are as usual oblivious to any of this as all they want to do is play. and the hedgehog? Well, nobody can really tell what he thinks about anything, really, as his personality is so unusual we aren't even entirely sure he is completely animate or mammalian. And so our house - the Triple M Zoo - has gone from one dog, one cat, three ferrets, one hedgehog and two hoo-mans to one dog, three ferrets, one hedgehog, two hoo-mans and two cats. It seems we have struck the perfect balance as all seem happy and content (well, again who knows what the hedgehog thinks, really). During my recent illness the IJB was away for a few days and I found myself surrounded by one dog and two cats, the dog keeping a watchful eye on me, the black as night cat cuddled at the end of the sofa on my legs and the orange and white puffball of purrs planted dead centre on my chest and staring into my one good eye. I doubt I will ever be alone again in this house, really, as it is so stuffed with animals I cannot imagine it ever happening. There are many more tails from the zoo to share, as Sirius and the new arrival are as different in personality as they are in appearance - but for today this will suffice to introduce the new resident. Oh, and his name? Well, in a house where we don't much go for usual names it seems his name is Smaug, after Tolkien's dragon. 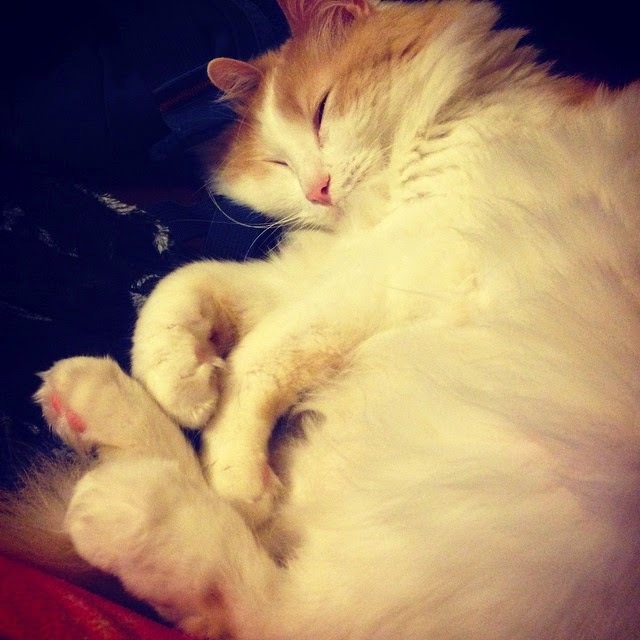 While Smaug isn't much like his namesake I suppose he does have a rather ferocious purr which sounds much like two motorboats racing on the Snye and which I suspect could wake the dead or terrify unsuspecting hobbits. And while he may not be much like a dragon he has, most certainly, captured our hearts with his gentle ways and his sweet manner - and so today I officially welcome Smaug to the Triple M Zoo - and announced with finality that this inn is, at last, truly full. There are a few things that get people really, really excited, and not in a good way. Death, taxes, graffiti...yes, graffiti, as I discovered when I posted recently about an innovative idea for graffiti and had the audacity to refer to graffiti as art. You always know you've hit the button when fights start on Facebook and you get more than one vitriol-filled email accusing you of plotting the destruction of the world through your nefarious blog posts. Usually this kind of reaction is reserved for political posts or those having to do with municipal issues (man, have I ever been anonymously spanked over some of those) but on occasion another topic so inflames and incenses that people get a wee bit dramatic. Such is the case with graffiti, apparently. My particular favourite is when people send messages in ALL CAPS because you know they mean business when THEY USE ALL CAPITAL LETTERS TO MAKE THEIR POINT. Graffiti certainly seems to bring out the all-caps crowd, which is intriguing because it seems like a fairly minor issue compared to the whole death and taxes thing. Nobody likes property being defaced, including me. However I also believe in innovative solutions and in grassroots movements. I happen to think yarn bombing and guerrilla gardening are pretty cool, and the idea of encouraging graffiti artists (there I go calling them artists again, cue the angry all-caps types) to paint on plastic wrap seems like a great way to address some of our current graffiti woes. I think many people fail to make a distinction between a graffiti artist and a tagger. Graffiti artists create works that may not appeal to everyone but that go beyond "tagging" everything in sight with a few shots of spray-paint for the sole purpose of name recognition. A tagger might take seconds - an artist could take hours. Taggers don't seem to care much about aesthetic quality. Lumping taggers and graffiti artists into the same group truly isn't fair as it's like comparing my doodles to the work of Picasso. There are some who believe graffiti of any kind has no redeeming qualities of any sort. They aren't interested in innovative ideas for allowing graffiti artists to do their thing while also protecting private property, and I'm not only cognizant of that but fine with it. But I swear to god the next person to send me an an angry email will find their words spray painted across my back fence for the entire world to see. I don't actually know who found him. I have long suspected it was my mother and that perhaps that moment in time was responsible for some of her later struggles, but I don't know for certain as she and I never discussed it. In fact I never discussed it with anyone until after my mother died unexpectedly because while it wasn't a family secret it wasn't out in the open, either. My maternal grandfather committed suicide. From what I have gleaned he ended his life shortly after my maternal grandmother died after suffering a cerebral aneurysm. My grandparents were very close, apparently. My mother often spoke of their marital bond, and from her words I could see that she worshipped them both. She described her father as "sensitive", likely in reference to a man who struggled with mental health issues and seemed fragile to others. I never knew either of my maternal grandparents, both gone long before to tragic diseases. This narrative is one that has hovered over my family for decades. While it was never completely hidden it was never really pulled into the light, either. The stigma of mental illness and suicide is a deep one, powerful and tough to counter. My mother never spoke of her father's death, although she would often speak of her mother's. I have tried over the past three years to break the cycle. I have shared stories of my struggle with depression, and stories of my mother's long battle with mental illness. I have openly discussed the genetic legacy of mental illness in my own lineage, and yet for some reason I admit it took me a very long time to tell the Intrepid Junior Blogger how her great grandfather died. I suppose it is because I didn't know how to explain it. I didn't know how to have that conversation, but last year I did. I wrote about World Suicide Prevention Day, and I sat down with my daughter and told her the few details I know about her grandfather's death. I suppose it is why I have become so adamant about the fallacy of calling those who commit suicide selfish. From my mother's description of her father I know he was not selfish. His death was not about a selfish choice. His death was about a troubled man dealing with a disease he did not choose and that is in the end no different from the disease that killed my grandmother. Her death from a cerebral aneurysm caused by a weakened blood vessel in her brain was not her choice. My grandfather did not choose to suffer from a mental illness that led to taking his own life any more than my grandmother chose her illness. Mental illness is a disease just as real as brain aneurysms, heart disease and diabetes, and can be just as deadly. Just as in other diseases early intervention can often prevent the worst outcome. In the case of mental illness and those who may consider suicide such intervention is crucial. Things have come a long, long way since my grandfather's death but we still struggle to break down the stigma surrounding mental illness and suicide in particular. It is still a topic we try to avoid and one we find difficult to talk about with our family, friends and colleagues - and yet it is so vital to do exactly that. It is the most difficult conversations we often need most to have. In many ways I regret never talking to my mother about her father's death, but my mother was sensitive, too, and I suspect her fragility was rooted not only in genetics but in the untimely death of her parents. They were both lost to diseases that seem tied to my family through our genetics, not diseases of our choice but ones with which we contend regardless. It was difficult to tell my daughter about my grandmother's death and the fact that cerebral aneurysms can have a genetic link. It was equally difficult to tell her about my grandfather's death and another disease that is tied closely to our family. But knowledge is power and education is a tool, and these discussions have better equipped her for the future. We have begun to break down the walls of silence in my family and to talk about our genetic legacy, the good and the bad, and all the factors that make us who we are. Wednesday is World Suicide Prevention Day. It is the day to bring it out into the light, to talk about it with friends and family and colleagues. It is the day to remember how it has touched our life and to learn how we can prevent it from touching the lives of those we love. For me it is another opportunity to tell the IJB about her great grandparents, and not just their deaths. I will share with her the loving stories my mother told me and I will share with her the stories of their deaths. It won't be an easy conversation - but it will be one so very necessary to have. Have you signed your organ donor card? I know this seems like an odd question to appear out of nowhere. It isn't really nowhere, though, as you see within the next few years I am likely going to need one of your corneas - or at least someone's cornea. I have endured a chronic eye disease for fifteen years. After years of irritating medications, repeated assaults from the virus that scarred it and emergency glaucoma surgery, my left cornea finally surrendered this week. The perforation in my cornea, while small and likely repairable at this point, is an indication my cornea has begun to degrade, and the time to consider joining the corneal transplant waiting list may have arrived. I have known for some time this could be coming. About eight years ago my ophthalmologist at the time asked if I had considered a transplant to address the deep scarring of my cornea. I was so used to the scarring, though, that I rejected the idea. My brain has learned to virtually ignore the signals coming from that eye as they are of such poor quality, and I am not even certain what it would be like to see clearly with it once again. I have been so fortunate that my right eye has been unaffected and so I have muddled along for years, dealing with chronic eye problems but rarely of the severity that has occurred this summer. This latest development, though, has me thinking a great deal about donor cards and transplants. Current statistics are a bit tough to find but there are thousands of Canadian on the waiting list for new corneas. Some are in far more dire straights than I, needing two healthy corneas to replace their damaged ones, and some have been waiting for a very, very long time to see. And of course there are all the other organs needed in order to prolong the lives of others, but it is a topic we are still hesitant to discuss because it deals with things like death, a subject which makes most of us squirm. The reality though is that the people on waiting lists for hearts and lungs and corneas are just like me. They lead their lives like we all do until some part of their body fails them, like my poor cornea which has just grown weary of years of damage and insult. For some their very continued existence depends on that donated organ, while for some of us it will simply change our lives by just maybe allowing us to see again. This week I am in Edmonton as I receive care for an ophthalmologic emergency. It seems most likely that my cornea can be salvaged for now, but my future very likely includes a corneal transplant. As I sit here in my hotel room I think about that eventuality and how I have long known some day my vision in my left eye would depend on someone signing a small card indicating their wish to donate their organs, including their corneas, when they will no longer be using them. I always knew it would depend on a family who, after their own tragic loss, finds the strength and courage to allow some good to come from it in the form of changing and saving the lives of others. One day in the future I may well see the world far more clearly, with an undamaged cornea that once belonged to someone else. I am still working through my feelings on that, because as a writer I cannot help but wonder about the person who may one day allow me to see. And I know this: they may be signing their organ donor card right now, or thinking about it. It is humbling to be so reliant on the kindness and generosity of others, particularly when that generosity means they must think of their own death. Now I look into a future that includes seeing through the eyes - or at the least the cornea - of someone else. I hate to ask, but when you aren't using them anymore any chance you could spare a cornea? I would be so very, very grateful - as would the thousands of other Canadians waiting for corneas, hearts, lungs and more. Sign your donor card. People just like me - in fact, me - are relying on you to do it. And we want to thank you in advance for giving us the gift of life - and sight. I could never get the hang of it. It came up in almost every drama workshop, an "exercise" designed to break the ice and make us work together, trusting each other. But I couldn't do it. "You are stiff as a board when you fall," said the instructor. "The idea is to relax and let yourself actually FALL," they would say, shaking their head in frustration. "You need to learn to TRUST people to catch you." "It isn't about trust," I would say, my own frustration mounting as I tried again and again to simply let myself fall into the outstretched hands behind me, allowing them to catch my limp body before it hit the ground. "I can't ask people to catch me. I don't know how to ask that," I would say. "I don't think you get this exercise," the instructor would say sadly, convinced it was about trust or a lack thereof - but it wasn't. It was about the inability to ask for help, even if it meant avoiding hitting the ground. I was the child who never asked for anything, you see. I suppose I grew up very comfortably with parents who could provide well for me, but even so my mother would often remark about my lack of requests. I never asked for new clothing or money or toys. I never asked because I didn't know how to ask, and so I was always just content. When I graduated from high school a cousin came to live with us. She was going to school in the city and her parents lived a fair distance away on a farm. When they came to visit her and us they brought her a small stereo because she had asked for one. A day later my father came home with a small portable stereo (aka the ubiquitous 80's "ghetto blaster") and left it on my bed. I was perplexed and when I said thank you my mother told me it was because I never asked for anything, even if I wanted or needed it. Over the decades, and particularly in the last two years, I have become far better at asking although it is still difficult for me. It is not about a lack of trust but rather about an inability or unwillingness to show vulnerability in this way, admitting to needing help. I am on occasion distressed that the Intrepid Junior Blogger displays the same behaviour, unwilling to ask for help from teachers, store clerks or friends. It is not necessarily the most beneficial of behaviours to pass on, and I ponder how to change it. I suppose first though I must change myself. This week I let myself fall. It was hard to release myself that way, to let myself go limp and ask those around me to catch me. I won't go into the details - not yet - but what I found was that when I asked those around me to catch me what formed beneath me was a safety net woven from the hands and hearts of friends, family and colleagues. I let myself go limp and simply fall into their hands, always knowing I could trust them but finally finding a way to ask them to catch me. This week I went into a free fall, but it was ok. Those hands that were always there waiting were right there to catch me, and I didn't hit the ground. I sit and watch her go, freshly dyed ebony black and lime green hair streaming behind her. The hair almost matches the emerald green shoes, with just enough difference in shade to keep it interesting. She has grown so much over the last few years and I as I sit there I realize we have entered yet another stage of this adventure we call childhood, except she is no longer a child in many ways. She is off to high school and I am sitting in my car, and that sniffling noise you hear is most certainly not me fighting off tears. 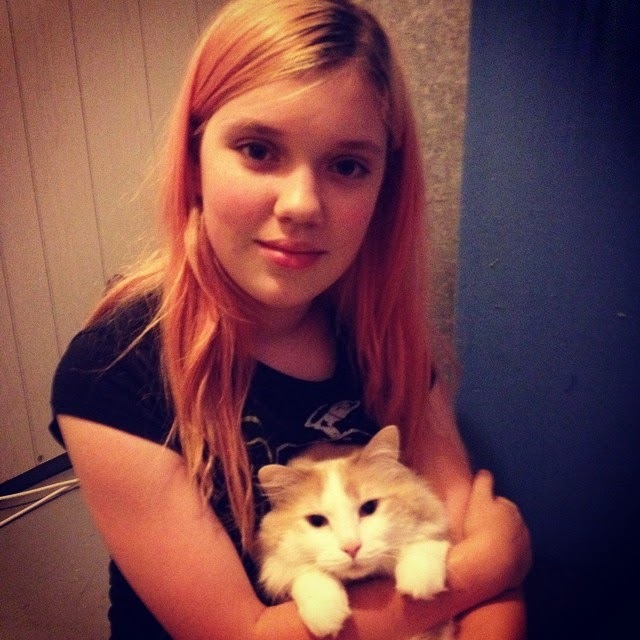 This year the Intrepid Junior Blogger entered high school as a Grade Ten student. Watching her bounce up the sidewalk with confidence in her stride reminded me of all the “first days” over the last ten years, every single one of them at schools within the Fort McMurray Public School District. She is now a Westwood High School student, one of the many entering those doors that will arrive as new students and leave as graduates. Parenting is full of trepidation. You worry if they will find friends, if they will meet the expectations of their teachers in terms of academics and behaviour and if they will be happy. It is always such a tremendous relief when they are happy, and I am so incredibly grateful that the IJB has begun this new adventure, the final chapter of her educational life here, with happiness. “How were the first two days?” I ask. I am surprised only because the IJB is not typically effusive about most things, being far more reserved than her mother who loves everything almost indiscriminately. The IJB is far more careful and measured in her evaluations, and few things beyond her pets, some select websites and her beloved computer games are deemed “terrific”. I pause because while I studied chemistry long ago I do not recall the fine details, and so she patiently explains isotopes and atomic weights and shows me how she has to memorize the first 32 elements of the periodic table. She is happy, engaged and excited about her first semester in high school, and I am so equally happy and grateful I almost find myself in tears. When I went to the orientation for students pursuing AP courses I suspected the IJB would love her teachers and her classes. I pretty much fell in love with the teachers myself, wishing I had teachers like them in high school, brimming with enthusiasm for their subjects and students. I had a few teachers like that, especially my English teacher who not only taught me to write but to strive to excel. It was those teachers I remember, the ones who shaped my school experience and who even now I think about on occasion – but that was then, and this is now, and my high school days are long over. The IJB’s have just begun. I think perhaps it is not always easy to be my kid. On occasion the IJB will comment on how strange it is when her friends say they read my blog, or when people recognize her and refer to her as “Theresa’s daughter”. The IJB is very much her own person, with a strength and resiliency and character that is all her own and in some ways much like me and in many ways far, far different. 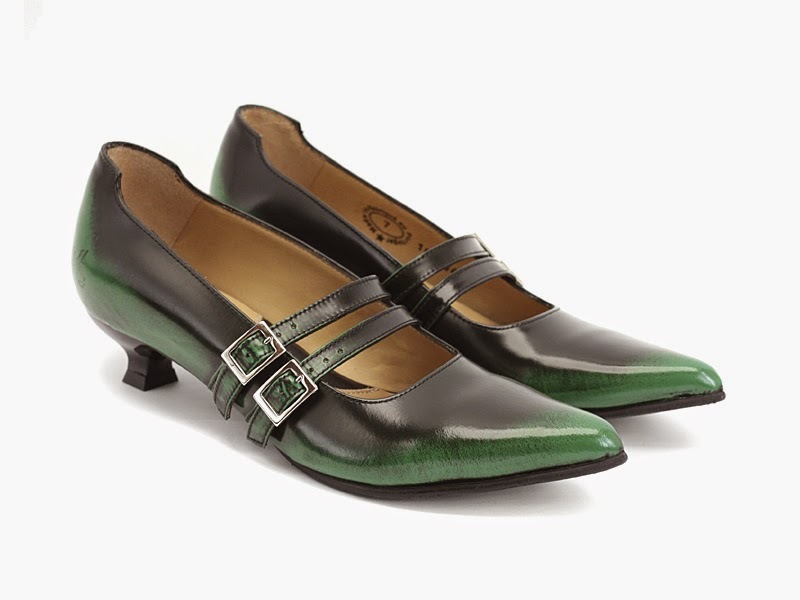 “Oh, and one of the teachers stopped me in the hallway to tell me she loves my shoes,” says the IJB and grins at me, her love of good shoes, especially the Fluevogs we both adore, written on her face. I grin back because while she is her own person and quite different from me this apple has not fallen far from this particular tree. 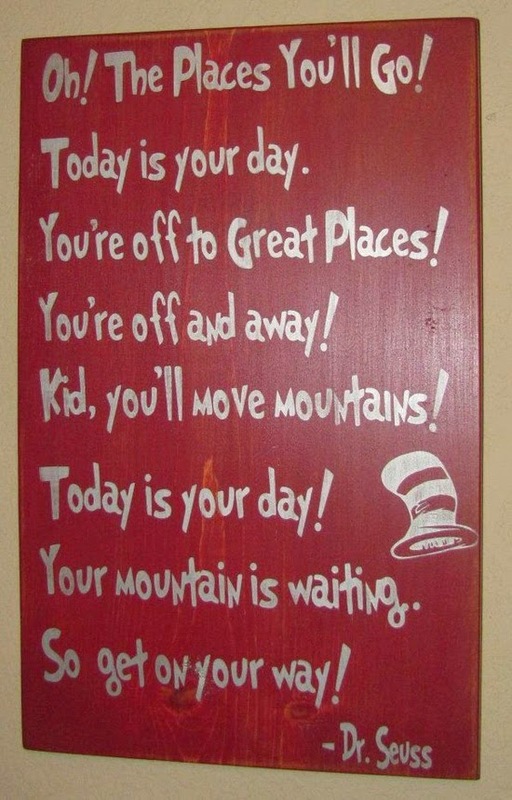 As the venerable Dr. Seuss wrote, today is her day. She is off to great places. She is off and away. “You don’t SEEM like a crunchy granola mommy,” he said. I was bemused by this response when I once told a man that I was an ardent supporter of breastfeeding. Somehow in his head he had linked breastfeeding with the earthy, Birkenstock wearing mommy crowd – and absolutely no offense to them as they do exist, but I am not one of them. “You seem pretty normal,” he continued. Normal indeed, much like the crunchy granola mommies are normal, too, and much like breastfeeding is normal, and the way nature intended for us to feed our young. I should make clear I am also not one of those moms who levels judgement on other moms for choosing formula for their babies, but I do believe in the benefits of breastfeeding – and even more than that I believe in ensuring the moms who choose it receive the support they need to succeed, because while it is normal and natural often new moms need that support. It’s why I was pleased to attend the recent anniversary celebration for the Fort McMurray Breastfeeding Support Group. Held in the concourse of the Suncor Community Leisure Centre it was wall to wall mommies and babies, taking me back to a time when the Intrepid Junior Blogger was much, much smaller. The IJB was born in a small community in northwestern Ontario. I fully intended to breastfeed, and thanks to the support of the local La Leche League I had strong support getting started. When she was three months old, though, I developed the chronic eye disease with which I still contend even today, and my ophthalmologist tried to convince me to give up breastfeeding to use oral medications that he was worried could prove harmful to my new baby. I was terribly torn as I was committed to breastfeeding my daughter and I was devastated at the thought of quitting when we had just gotten the hang of it. I went online to search for information, and that was how I found Dr. Jack Newman, the Canadian physician who has proven the saviour of breastfeeding women everywhere. I fired off an email to Newman, never expecting a response – but not only did he respond to me he contacted my ophthalmologist and between the two of them they devised a treatment plan which would not require me to give up breastfeeding my daughter. There were people who thought the lengths I went to were absurd, but I knew I wanted to breastfeed and I was going to do it, come hell or high water – and I did, weaning my daughter when she and I were ready and having been satisfied that both her needs and my medical needs had been met. Being surrounded by breastfeeding moms, pregnant women and those who support these important initiatives for women took me right back to those early days. I was grateful for the initial support of my local La Leche League, but even they were in a bit over their heads when it came to the medical crisis I faced. What I would have appreciated back then was an even larger core of groups dedicated to supporting women who choose to breastfeed and who could provide the resources I needed when things got tough – which is why I am so grateful to see this kind of support network in our community. I have written in this blog about our need for a birthing centre as our community grows with each new family member added. I have written about the need for doulas and midwives, the support systems many pregnant women seek, and I have written about breastfeeding. And this isn`t about saying breastfeeding is the only choice, or that doulas or midwives are better, or that birthing centres trump hospitals – it`s about providing women with the options and support they need as they bring our most important asset into this world: our next generation of citizens. Every member of a community is important, of course, and we all have our respective roles. To me, though, there can be no more important role than raising children as the continuation of our species, community and society relies on that very act and I am not only an advocate of breastfeeding but an advocate of parenting as it is so very vital. As a community and society we have a responsibility to provide the support and encouragement and fundamental services parents need so they can focus on what matters most: the children. You see it takes a village to raise a child, and in our village we need to come together to support those raising the children, making sure their parents have the best possible support, resources and options they can to succeed in their incredible role in building our community. to support local moms and babies! The email was clearly not in English. In fact I wasn’t entirely sure what the language was, and I would have entirely ignored it had I not caught three words that meant something to me: Zhen Shan Ren. I copied the entire email, pasted it into an online translator, and connected with a blog reader from across the world. It is always a remarkable feeling when something you have written reaches an audience you didn’t even know existed. It is even more remarkable when that audience reaches out to you and tells you what your written words have meant to them. In the past couple of weeks this has happened to me repeatedly as the blog post I wrote about the recent Art of Zhen Shan Ren International Exhibition at the MacDonald Island Community Art Gallery spread around the globe. It all began when the post was shared on a Facebook page devoted to the exhibition. The administrator of that page contacted me to let me know she had posted it there, and I was delighted to see that it was being well received. I was even more delighted, though, when emails began to pour in from several points across Europe, all connecting over an incredibly profound art exhibition that had tremendous impact on me. But the readers didn’t just drop by to read that post. Some of them stayed to read about a little community in northern Canada, far removed from their worlds and a world apart – and then they contacted me with questions. Some of them wanted to know about job opportunities here. Some wanted to know about life in northern Canada. One asked if I had ever seen a polar bear (the answer is no, they are found much further north). Almost all of my new correspondents expressed interest in our community and in life here. Most had never been to Canada – and most had never heard of Fort McMurray. You never, ever know what will happen when you put pen to paper or fingers to keyboard. A little post, heartfelt and written after you have experienced something deep and meaningful, can connect to a far wider audience than you expect. Even more than that, though, it can mean that you have introduced someone from far away to your community – not through a magazine article written by a visiting journalist, not through a documentary filmed by a visiting film crew, but through a community resident who lives here, works here, plays here and has found her heart here. In the past two weeks I have welcomed several “virtual visitors” to Fort McMurray. The found me – and us – through this blog, and I am once again humbled by the opportunity to share my story of life here every day with you and with them. On occasion I have wondered if this blog had meaning – and on days like today I suppose I feel it does. On days like today I open my email and find yet another email in a language that is not English, and I translate it quickly to discover a new correspondent – and a chance to continue my small effort to connect Fort McMurray with the world. Sometime the best discoveries aren't the ones I have made at all. They are the ones that filter their way to me through friends and acquaintances, often culminating in an email or conversation that starts with: "Did you see this?". This happened to me recently when a friend sent along a photo that proved very thought-provoking, sending me off on a tangent as I considered the nature of graffiti, vandalism and art. 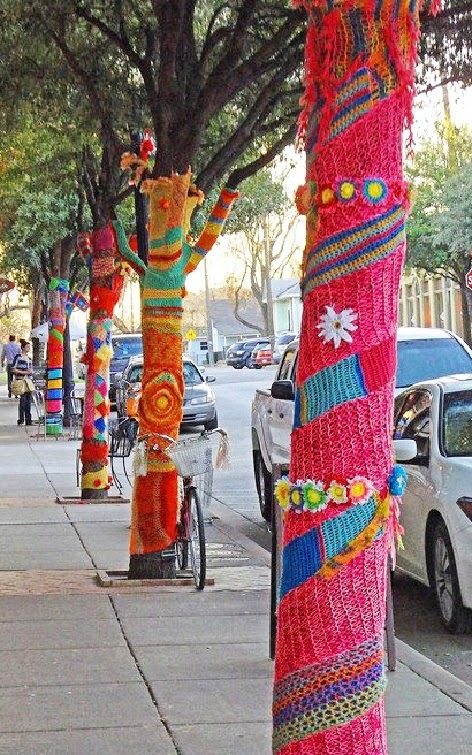 Yarn bombing and crochet graffiti are a huge hit in many urban centres, brightening up the landscape with the work of fibre artists who adhere their intricate creations onto trees, lampposts, bike racks, railings and more. Legal or illegal? 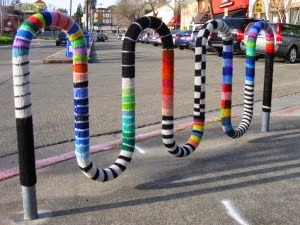 Technically littering but also a work of "guerrilla art" designed to evoke smiles and bring cheer to dull landscapes. 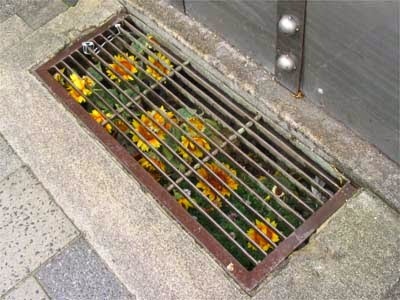 It is called "guerrilla gardening", and it is the work of those who use spaces such as this as the canvas for their works of living (and often edible) art. Legal? Technically the space belongs to someone else, I suppose, and one could claim vandalism. The reality is that we have a graffiti problem in this community. The problem, however, is not the type of creation but the place where it is being created. Graffiti on the side of a building, defacing it and affecting the tone of the neighbourhood around it, is clearly vandalism and cannot be tolerated. 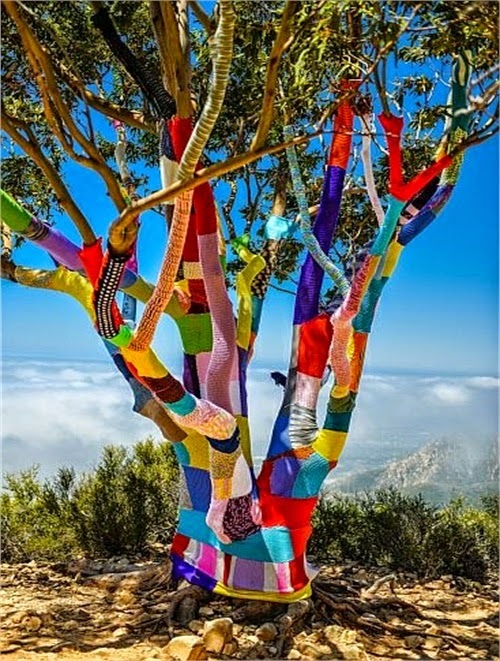 But graffiti on plastic wrap stretched between two trees, yarn knitted onto a bike rack or flowers planted under a grate? I think these are examples of creativity and - yes - art, that we should encourage and applaud. To the creator of the local plastic wrap graffiti I want to say thank you for the creative idea, for sharing your work and for asking the question: "Is this legal?". 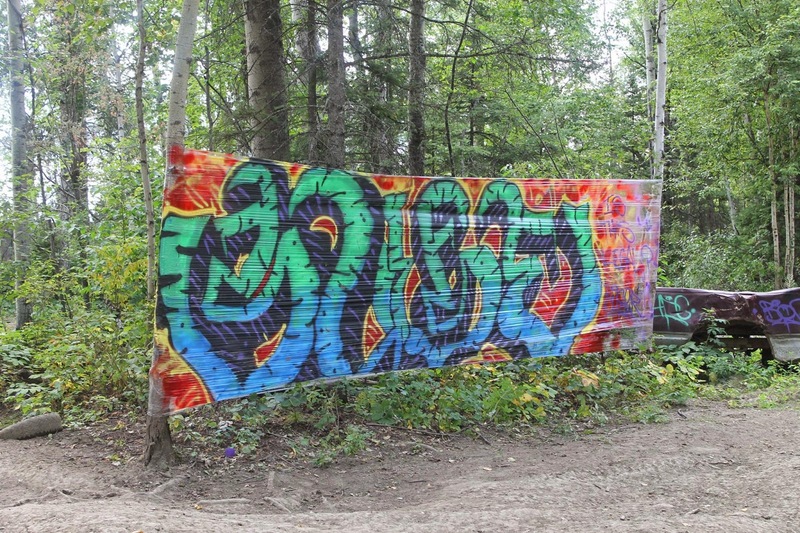 I don't know the answer, but I know this: I think it is a terrific way to build a bridge in this community between those who create graffiti and those who want to keep it off their property. 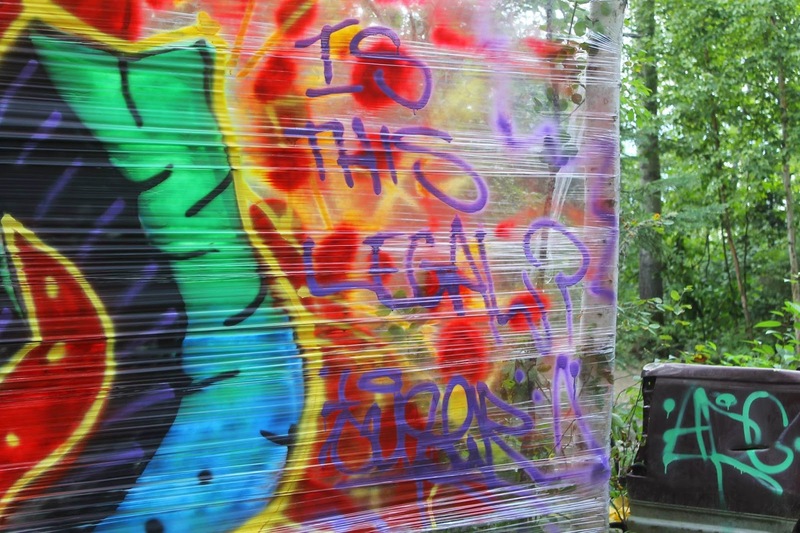 I think perhaps what we might want to do is invest in a whole lot of plastic wrap and invite the creators of graffiti to enjoy their new canvas while we enjoy the results of their creative expression. One simple question can sometimes provide the simple solution to a complex question, and we should never be closed to the possibility of exploring those solutions, even if they seem far, far too simple indeed.